American identity is in the air, thanks to a gaggle of presidential hopefuls who rant endlessly about immigration, American values, and what makes this country great. 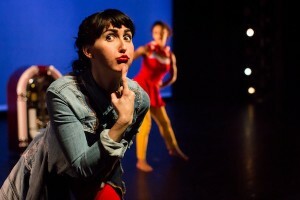 Leave it to the modern dancers to take their own more nuanced stance, which is exactly what happened on the Open Dance Project stage during their recent show at the MATCH, called Stories to Tell. Alisa Mittin and Lauren Burke in American Me/I/We. Choreography by Annie Arnoult. Photo by Lynn Lane. Annie Arnoult, a Houston native, who has recently returned to town, runs Hunter Dance Center and is the artistic director of Open Dance Project, the city’s newest contemporary dance company. 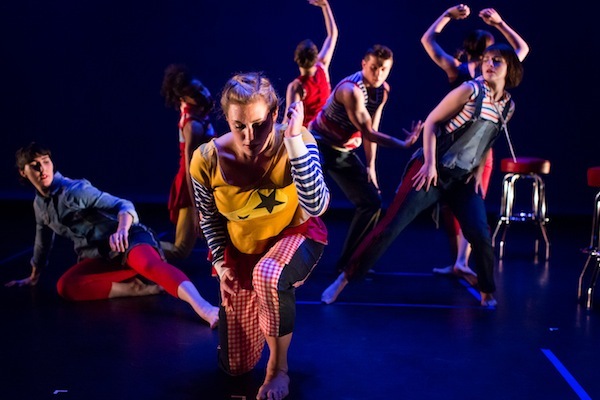 Stories to Tell included three of her works, all of which focused on Americana in their own way, as well works by company member Alisa Mittin, Houston dance artist Jennifer Mabus and guest choreographer Lizzie Leopold. It’s not often that you hear the 1908 Tin Pan Alley song by Jack Norworth and Albert Von Tilzer, “Take me Out to the Ballgame,” one minute and Ralph Waldo Emerson’s transcendentalist views spouted the next: so it goes in Arnoult’s American Me/I/We, a sprawling, slightly unruly (but aren’t we that way?) examination of the grand mishmash of American identity. Yet, the piece is also a study of pluralism, with each dancer on their own mission to some extent, with moments of unity adding punch. One of those moments featured Mittin giving a impromptu lecture on the famous Stanford marshmallow study about delayed gratification conducted in the 1970s by psychologist Walter Mischel. Mittin’s clear dancing and natural speaking style made this passage come to life. But really, all of the dancers were distinct in their own ways. Besides Mittin, Lauren Burke, Abby Flowers, Elizabeth “Nalley” Grossberg, Tahillah Hartmann, Kate Rash, Stacy Skolnik and Davis Stumberg made a mix that was truly the glue for American Me/I/We. Jennifer Hancock’s denim, red and blue costumes added a patriotic flavor. Brit Deveau with ODP Ensemble in Pretty Boy. Arnoult’s Pretty Boy, accompanied by Garreth Broesche’s outstanding American Roots Ensemble from University of Houston Moores School of Music playing the iconic songs of Woody Guthrie, also took up the theme of origins, home and place, this time with more lively ensemble dancing intermixed with the dancers’ family stories. I appreciated the family stories, but in the end the piece felt unfinished, and perhaps in need of second chapter. The terrific dancers included Burke, Flowers, Grossberg, Hartmann, Taylor McAnulty, Mittin, Rash, Skolnik, Stumberg and Juan Ventura. Emily Hardey’s wistful voice in “I Ain’t Got No Home” also deserves mention. The concert’s namesake, Stories to Tell, took a more lighthearted approach to storytelling, this one about life on the American prairie, set to music by the Jenkins Farm Score by Cobly Beserra and Matt Reed. All three of Arnoult’s works included spoken text, which worked well when integrated into the choreography, and less well when it stopped the action. There was also a slightly nostalgic feel to the concert, harking back to the autobiographical focus of the 1990s in modern dance, where artists were obsessed with telling their grandmother’s stories, myself included! Alisa Mittin and Jhon Stronks in reality monitoring. Choreography by Alisa Mittin. Photo by Lynn Lane. Continuing on the plurality theme was Arnoult’s choice to share the stage with other artists, each of whom contributed a meaningful piece. Mittin, continuing the work started during her Dance Source Houston residency and presented at the Barnstorm Festival, offered reality monitoring, a duet with the always interesting Jhon Stronks, and the most contemplative and atmospheric piece on the program. Her chemistry with Stronks is deeply rooted in process and discovery, which translates to the stage in a stunning way. When Stronks rolls her out from a green grass-like rug, we know immediately that we are in an altered reality. The spoken text is fragmented, strange, disarming and funny. David Deveau’s effective lighting added to the rare climate. Mittin also offered a little intermission fun with an excerpt from of time, partial, a duet with Skolnik in the lobby. Alisa Mittin and Stacy Skolnik in of time, partial. Choreography by Alisa Mittin. Photo by Lynn Lane. I was happy to see two solo works on the program. We don’t see enough solo form in this town. Hartmann mined the solitude of Arvo Pärt’s Für Alina in Leopold’s Aftermath, while Brittany Thetford Deveau brought out the details of Mabus’ intricate and delicate actions in Brightly Colored Paper. Now, a word about the theater. Not only was this my first time seeing Open Dance Project, but my first experience seeing a show in Matchbox 2, created specifically for dance. It’s a beauty, with perfect sight lines and a floor that made the wonderful dancers of Open Dance Project land without a sound. We are very lucky to have this space (and this new company) in our city. Nancy Wozny is editor in chief of Arts + Culture Texas a contributing editor at Dance Magazine.